Michael Sam was born today, January 7, in 1990. He is a former American football defensive end. He played college football for the University of Missouri and was drafted by the St. Louis Rams of the National Football League (NFL) in the seventh round of the 2014 NFL draft. Sam was a consensus All-American and the Southeastern Conference (SEC) Defensive Player of the Year as a senior at Missouri. After completing his college football career, Sam publicly came out as gay. He became the first publicly gay player to be drafted in the NFL. The Rams cut him during the final preseason roster cutdowns. He also spent time on the Dallas Cowboys' practice squad before being waived. He signed with the Montreal Alouettes before the 2015 season, and became the first publicly gay player to play in the Canadian Football League (CFL). In August 2013, Sam took the opportunity of a team introduce-yourself session to inform his Missouri teammates that he was gay, and found them supportive. He avoided talking to the media to avoid addressing rumors of his sexuality. He came out to his father a week before coming out publicly. The New York Times wrote that his father, a self-described "old-school ... man-and-a-woman type of guy." During his college career, Sam accumulated 123 tackles, including 36 for loss, 21 sacks, six forced fumbles and two intercepted passes. He graduated from Missouri in December 2013. He participated in the 2014 Senior Bowl in January 2014; considered too small to play as a defensive end in the NFL) he played as an outside linebacker. Sam struggled at the new position. The St. Louis Rams drafted Sam in the seventh round, the 249th of 256 players selected in the 2014 draft. 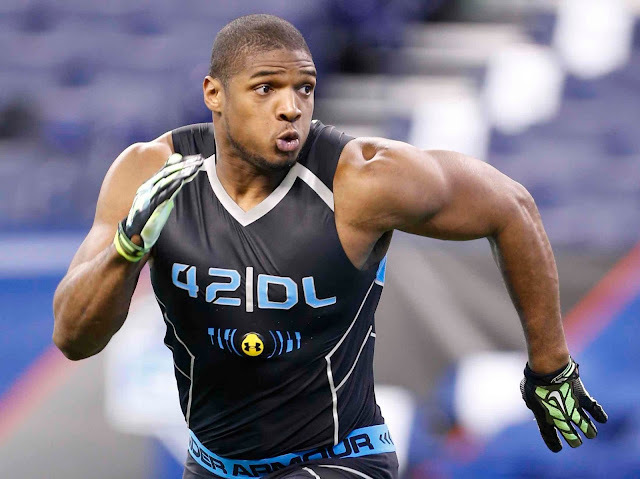 When he became the first publicly gay player to be drafted into the NFL, President Barack Obama said that he "congratulates Michael Sam, the Rams and the NFL for taking an important step forward today in our Nation's journey" and that "[f]rom the playing field to the corporate boardroom, LGBT Americans prove every day that you should be judged by what you do and not who you are." After being drafted by the Rams, Sam's emotional reaction to his draft was broadcast live on television, during which he kissed his boyfriend, Vito Cammisano. Reported to have been dating Sam for several months, Cammisano is a fellow alum of the University of Missouri who had been a member of the school's swim team. In January 2015, it was announced that Sam and Cammisano were engaged. However, the couple ended their relationship in June 2015, but remained friends. St. Louis Rams jerseys bearing his name became the second best selling rookie jerseys at the NFL's website. During the period from April 1 through July 17, Sam's jersey ranked sixth in sales among all NFL players. On August 14, 2015, Sam announced, on Twitter, he was stepping away from professional football due to mental health reasons. He currently shares his experiences as an author and motivational speaker. In April 2016 Sam spoke with LGBTQ advocacy groups at the Missouri State Capitol against a bill that would enable discrimination against LGBTQ people and personally lobbied state legislators. On February 24, 2015, Sam was announced as one of the celebrities to compete on the 20th season of Dancing With The Stars. He partnered with professional dancer Peta Murgatroyd. Sam and Murgatroyd were eliminated in the fourth week of competition and finished in 10th place. Sam won the Arthur Ashe Courage Award at the 2014 ESPY Awards. He was named one of GQ's Men of the Year, and a finalist for Sports Illustrated's Sportsman of the Year.